As promised, here’s my follow-up, a somewhat more opinionated take on the relationship between cops and the 99%. Scabs are paid to break a strike, and cops are paid to break a social movement. Cops are not part of the 99% as a movement (even if they are part of the 99% as a quantitative measure of relative wealth). When a union goes on strike, all of the striking workers agree not to work, as a show of solidarity against unfair labor conditions that would otherwise be imposed upon them. Striking workers form a picket line, and anyone that crosses that picket line, whether a worker who chooses to continue working, or a newly hired worker brought in to replace the striking workers, is called a scab. In terms of labor struggles, scabs are hardly considered part of ‘the movement’, in fact they are more likely to be seen as enemies – even if their personal motivation for breaking the picket line is humane and justified (I need to pay rent, I need to feed my family, etc.). Their actions directly weaken the power of the strike. So with the case of scabs breaking a picket line, you have a working class struggle where not all of the working class people involved can be considered allies. Potentially, they could all be allies, but for that potential to be realized, the scabbing workers would have to join the strike, and respect the picket line, and stop getting paid to break the strike. It’s not that different with #occupy. Our occupations are similar to labor struggles, in that we are collectively refusing to accept the inequality and injustices that would otherwise be forced upon us the 99%. Our occupations are our picket lines. And in that case, anyone who chooses to work in any capacity to weaken our occupation, even if they are working for their own very honest and respectable reasons, is functioning as a scab of our movement. 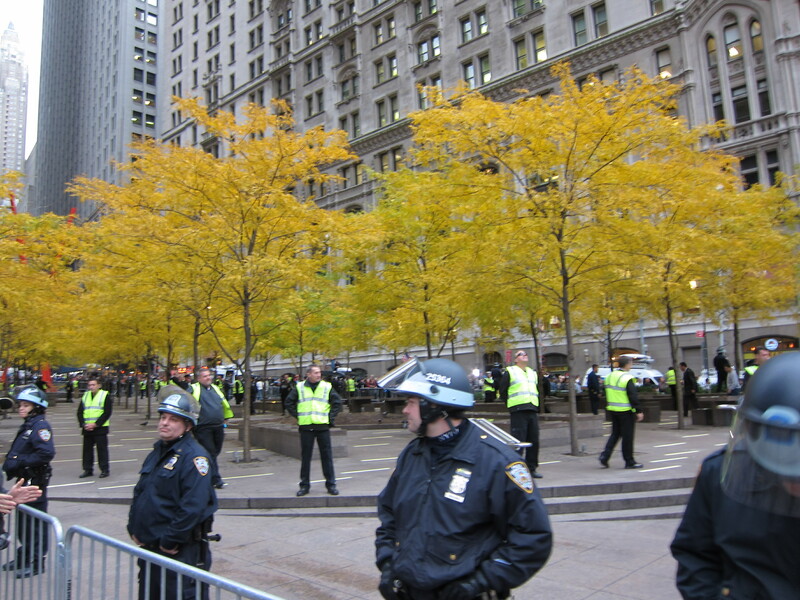 So that’s why I wanted to talk about those 11 freezing security officers standing in Zuccotti Park last week. Those guys are scabs. We were occupying the park, now they are occupying it instead, for management. This is where it becomes necessary to ask whether the 99% is defined quantifiably – by how much money is in your bank account – or whether it is defined by our allegiances and our actions. In other words, when we claim that we are the 99%, are we identifying with a large statistical category, or are we identifying with a growing social movement? There is a big difference between the two. If all we are is a big slice of a pie chart, then sure the cops are one of us. But if what we are is a social movement that wants to change the ways things are, that wants to challenge the powers that be and to create a new world, then the cops are not part of our 99%, not so long as they continue to follow orders to break our movement. Could a cop become part of the 99%? Sure, why not. We all get to choose which side to be on, cops included – but so long as they choose to accept pay in exchange for administering and supporting state thuggery, well then their choice has already been made. So that’s where I’m at, for now. If you disagree, please, help me understand why I’m wrong. 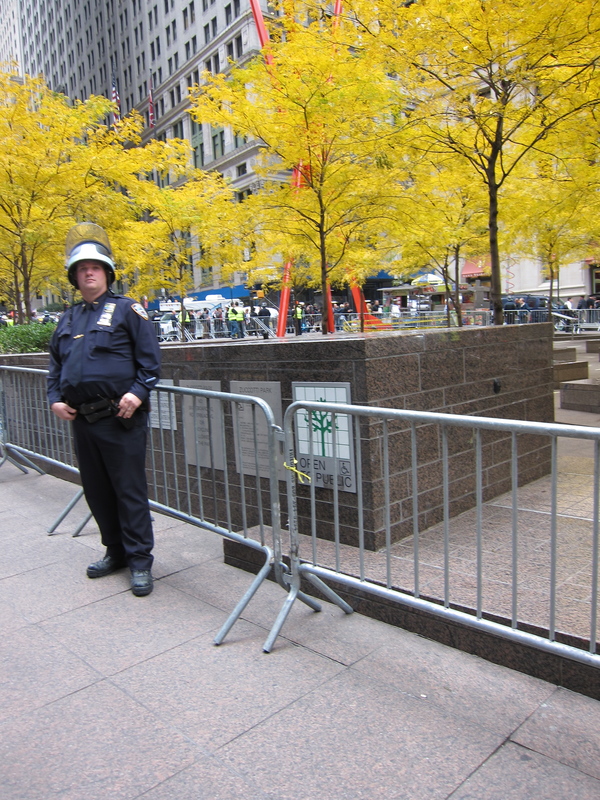 You can read ‘Cops and the 99%, Part I: Who do you serve? Who do you protect?’ here. 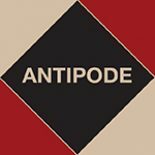 This entry was posted on 20 January 2012 by Antipode Editorial Office in News and tagged class, occupy, policing, protest, public space, solidarity, strike, the 99%, Wall Street, Zuccotti Park.